One of the most common things I see on estimates is swimming pool equipment either undersized or not working correctly. Both result in a pool that is working less than optimal. A pool pro, a real pool pro that understands circulation (not a pool guy you found on craigslist) will truly help you understand how things are working and how they can be improved upon. At least here in Florida, a true pool pro is someone who is going to be a licensed pool contractor with the State of Florida and have the insurance to complete the work. 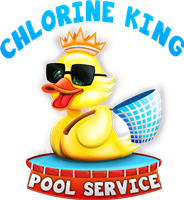 Chlorine King Pool Service holds both of these necessary requirements to do the work you need. Have you heard that phrase, "It's like a salmon trying to swim upstream?" Well, that's exactly what having either undersized equipment or improperly function pool equipment does for you. It's very cyclical too. You're always going to have the same problems if you have problems with your equipment. It's not a matter of if, but a matter of when! Below are a couple of things that can happen when you have equipment issues. Premature wear on your equipment. Thing of this. If you are driving a Mack truck through your front door, what do you think is going to happen? The truck is going to hit a bunch of resistance and destroy your front door all at the same time. That's what having an over powered pump or undersized filter will do. Both result in premature wear. Your pump is going to constantly meet resistance trying to push way to much water than what your filter can handle, and that will cause premature wear on the pump motor. Using the same example, the filter cannot handle all of the pressure the pump is pushing and the result is a premature failure of the cartridge. Both result in clarity issues for your pool down the line. Quality of circulation is lost. If your skimmer is clogged, a glue joint failing or a bad o-ring can cause a loss of water circulation quality. When this happens the circulation becomes erratic and a result is the water not being cleaned like it should each day. At some point it's going to cause clarity issues and algae growth. I've seen this over and over again. If your equipment is "hurting" it's time to refresh it and fix whatever problems you have. Your pool will thank you! This can cause havoc on everything else on your equipment pad. As mentioned above it could damage your filtering element, but it can also damage your heater if it's pushing way too much water than what the heater is designed to handle. Remember, water erodes material (think Grand Canyon) so how do you think the heater is going to fare? That's why it's so important to make sure the person installing your equipment is more than qualified to do so! Really the list can go on and on. The bottom line is I'd recommend a pool professional to come out and take a look at your equipment. That way, you can rest assured knowing that everything is in tip top shape. Here's a short video explaining some of the things pool professionals should look for during an estimate, and equipment is one of them!